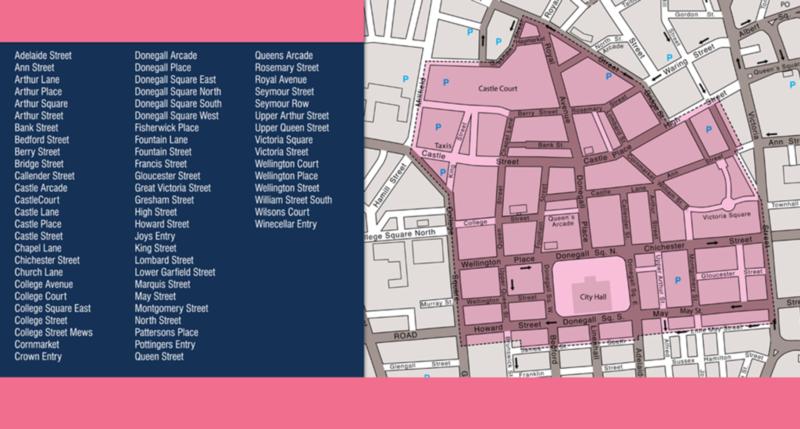 In October 2015 businesses in Belfast City Centre voted in favour of establishing a Business Improvement District (BID) – which is an organisation aiming to improve all the businesses in our City Centre – by driving footfall into the city; working to improve the environment – making it cleaner, more accessible and safer; and helping to drive down costs for businesses through group purchasing and so on. This is an established concept and there are over 200 BIDs in existence across the UK – its new to Northern Ireland and we are one of 3 set up so far. The legislation supporting the establishment of BIDs in Northern Ireland can be found here, and Belfast One has been set up as part of the Department for Social Development NI BID Academy Pilot Scheme; so our development process was prescribed and monitored by a consortium of consultants employed by DSD to oversee the introduction of BIDs into Northern Ireland. Belfast One BID is run by a Board of Directors made up of business men and women from across the city. You can view the Belfast One Business Plan online here. Belfast One officially opened for business in April 2016 and is set to deliver our 5 year business plan.